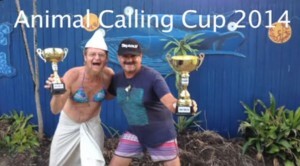 The Animal Calling Cup 2014 is the brainchild of Dr Didge Dolphin aka Arpana where humans get to tell a story, make their sound and be another species for a moment. It’s an annual Byron Bay celebration of animals and nature. By listening and imitating animals we learn to respect nature and each other . A fun event for adults and kids alike to imitate wild and domestic animals. This Clip also includes storys music and calls by Elder Uncle Lewis Walker.